I will never look at a mushroom the same way again. 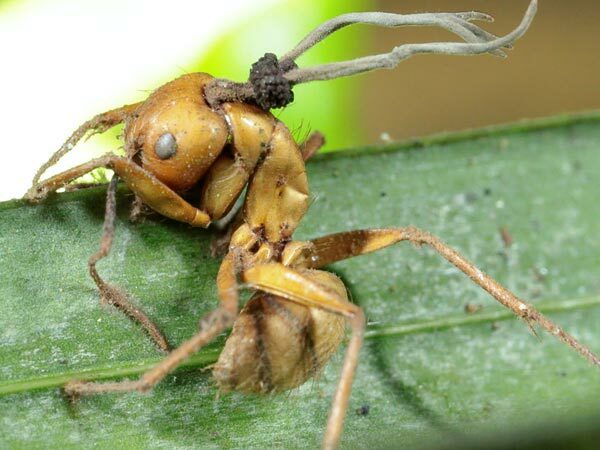 The April National Geographic has a new piece about Zombie ants, ants whose minds are controlled by a fungus which kills the ants in a bizarre way, at a location most suitable for the fungus. I once wrote a Master’s Thesis at Georgia Tech on yeast, arguably the most primitive fungus, the type of fungus that can drive women wild with infections, and drive all of us to distraction through its ability to ferment grains and juices to make alcohol. It all depends on the particular species of yeast, of course. It depends on genetics. I, and most any school kid, can vouch for the fact that fungus, in general, is not known for its high IQ. Of course, it has no brain per se, and apparently no neural circuitry at all. So I find it amazing that a fungus can do what our best scientific teams are incapable of doing – controlling minds. Admittedly, ants are not all that smart by human standards, but they are geniuses at being ants. They do have a brain, and typically their goal is to feed and protect their colony using well scripted behaviors. However, walking off into the jungle undergrowth and starting a new fungus colony in an ideal location, for fungus, is not part of their neural programming. And yet, the lowly fungus, against all odds, manages to rewrite the ant’s neural code to serve the fungi’s own reproductive purposes. Fungus can infect the human brain, and even kill. It is a big killer in immunocompromised, AIDS infected humans, and it kills by causing a potentially fatal meningitis. Perhaps it feeds off the brain, but human pathogenic fungi do not CONTROL the human brain. At least one naturalist described the Zombie ants as chimeras – part ant, part fungus. The way I interpret that statement, what the fungus lacks in terms of neural circuitry, visual and olfactory organs, and legs, it acquires by merging with the brain of the ant. So while we routinely manipulate lower life forms like cattle and oxen to do our bidding, it seems like quite a different thing when a lower life form controls a life form vastly more complex. But what is especially scary is that the difference between fungi that infect the human brain causing coincidental death, and fungi that control the ant brain causing a well manipulated death, is a matter of genetics. And what is one of the hottest scientific fields for now and the forseeable future? Genetic manipulation. Actually, it’s not the ants I worry about, nor the fungus. What I worry about is what scientists like myself might do with the knowledge that fungi can control brains, even if they are simple ones. The concept of directed mind control by the use of genetically enhanced fungal vectors is simply too Orwellian for me. Well you’ve made me feel just great about the mushrooms I ate earlier – especially since I know there are ants lurking near our front door. Should I feel uneasy or in danger of being carried away? No. Go on the offense and eat all the mushrooms you can. They can’t survive stomach acid. Problem solved.